Hi, I have been visiting your blong since a while, and I noticed you have quite a great experience on grafting techniques. I was wondering if you have ever tried to make a chimera. 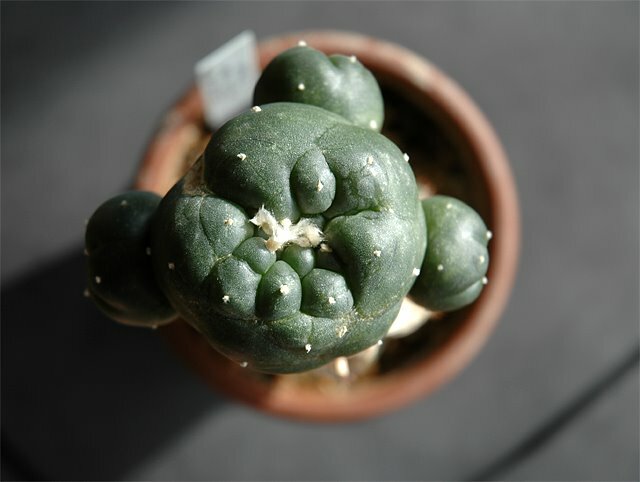 Maybe composed with a variegated lophophora and some kind of interesting stock. It would be great to know if you have done something like this. It seems to me quite interesting. Greetings from Mexico, and congrats about your blog. No, none of my grafts have resulted in chimeras, although two Lophophora williamsii seedlings grafted last year on Trichocereus pachanoi seedling stock is showing unnatural, elongated growth – I’m still not certain if it’s just a result of increased growth or if the scion has “fused” with the stock plant. maybe it's an increased growth. I think chimeras only arise when one cut the scion off the stock, and leaves a samll amount of tissue over it. It would be nice to see some more pictures of your graftings. Nevertheless I hope that are chimeras, it would so interessting to see one in that combination. Just a question: how many time would it take for a in a Pereskia sp.-grafted seedling of Lophophora to blossom? You’re probably right, it’s just increased growth – I’ve posted a photo and some additional information confirming your point that chimeras appear as offshoots where the scion and stock fused, at the discussion group http://groups.google.com/group/lophophora. Please feel free to join the group (even though it’s still in its budding form ;-) Also, if you have more information on how to induce chimera growth forms, I would very much like to hear about it. I haven’t done any Pereskia grafts and only a few on Pereskiopsis stock. 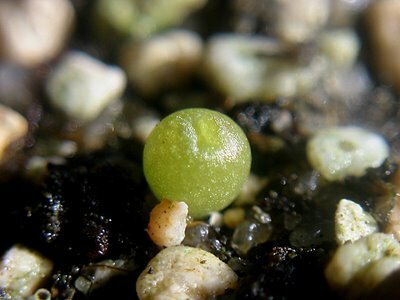 One of the Lophophora williamsii I grafted last year on Pereskiopsis has grown to a width of 3.2 cm, but is showing no signs of flowering yet. You have problems with self-pollinated seeds? So far I have planted eight self-pollinated seeds and five of them have germinated. I suppose it still early stage but they seems to be going well.